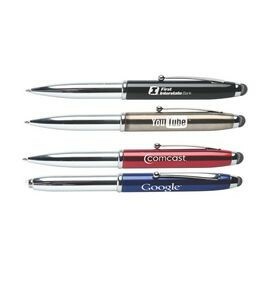 Your logo + a triple function pen = marketing success! 4 great barrel colors (black gun barrel, red and blue) so you can point, write or shine your way to promotional success! This pen is a 3-in-1 multi-tasker. It features a ballpoint pen that quickly changes to a Mesh stylus pull cap with advanced connectivity for all touchscreen devices and a bright and powerful push-to-activate LED flashlight. The high gloss chrome and enamel barrel comes with a silver engraving of a logo, name or custom design to get your promotional message across. Click on the pen to go to our research site for information on pricing, minimum quantities, etc. A simple pen is certainly useful but doesn’t really stand out. The purpose of a promotional product is to gain attention. This pen may cost more, but it’s not going to be tossed in the trash or hidden in the back of a drawer!